This Global Gourmet recipe is a dish we fell in love with while traveling in Spain. Pulpo a la Gallega, or Spanish Octopus, is a typical Spanish dish from Galicia in the north west of Spain. It is often served as a small plate, or tapa, but can also be served as a main. I never really appreciated octopus before we spent time in Spain and learned how octopus should really be when it’s done right. Too often, octopus has a rubbery texture from improper cooking technique, which is a far cry from the soft, buttery pulpo we ate in Spain. You may be thinking that if restaurants can’t do octopus right, there’s no way you can do it at home, but that’s not true. If you follow a few easy steps, you can make delicious, melt-in-your-mouth octopus at home. And if you’re like me, the challenge is enough to get you to try it. So here’s my challenge to you – if you enjoy eating octopus in Spain, give it at try at home! ⇒ See more foods from Galicia you just have to try! A shortcut to cooking octopus at home is to buy frozen octopus, which eliminates the need for tedious cleaning. Frozen octopus comes cleaned and ready to use. All that is required is to defrost and cook. Some say that freezing the octopus helps tenderize it. Once it’s completely defrosted, you can tenderize it some more by lightly pounding it with a meat mallet. This step is not required, but it might lead to a softer texture. For me, the only way to cook octopus is to confit it, which means slow cooking it in oil on the stove. I use a good quality Spanish olive oil. It has the perfect balance of sweetness and pepper, but with a mild olive taste and aroma. It doesn’t overpower the octopus, but enhances it by adding a fresh, herbacious flavor. Whenever I cook octopus this way, I try to combine it with other great olive oil recipes, so I am sure to get the most use out of the oil. Not a single drop of precious olive oil should go to waste! So, I also have an extra special add-on recipe, that will utilize the cooking oil (see below for details). We’ll get into exactly how to make the octopus and the special add-on recipe in a moment. First let’s talk about an appropriate wine pairing. As I mentioned before, the most important factor of good octopus is the texture once cooked. That is what makes it a difficult thing to make at home. And that is why I use olive oil to slowly poach it. Some people swear by tenderizing it with a mallet first, or by boiling it with a cork in the water. I think slowly cooking it in olive oil, and being careful not to overcook it, is all you need to produce delicious octopus. Poach the octopus in olive oil over low heat for about an hour. Overcooking it will make it tough, no matter what else you do to it. I’ve also found that boiling it in water leads to rubberiness, and that’s why I now use olive oil to cook the octopus. Make sure the oil is set on a low heat so it doesn’t boil or bubble. It should slowly cook the meat without frying it. You’ll know the octopus is done when you can easily pierce the skin with a knife or fork. It takes about 60 minutes for a 3-pound octopus. When you take it out of the oil, let it drain and cool for a few minutes on a cutting board until you can handle it. Cut the tentacles to the size you wish to serve them. At this point, you have a choice to make about how you want to serve it. 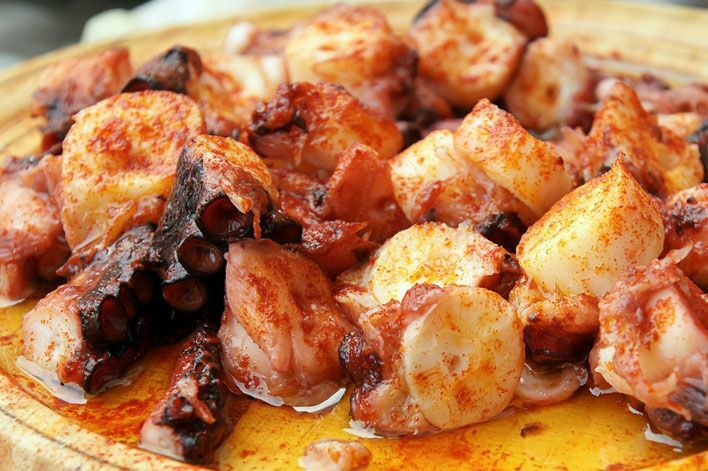 Pulpo a la Gallega is typically served cut into small pieces and dressed very simply with olive oil, salt and Spanish paprika (like in the picture at the top of this post). To make it a more substantial meal, add boiled potatoes to the plate. It’s delicious that way! Octopus over boiled potatoes and garlic cream sauce. Another way to serve it is to keep the tentacles whole and serve over potatoes, with a creamy garlic sauce. We’ve served it and loved it both ways. It’s up to you! A lot of different wines can be paired with octopus, but I think the best pairing is a bright, zesty and crisp Albariño from Rías Baixas in Galicia, Spain. The varietal thrives in the drizzly corner of northwestern Spain. There is a minerality to Albariño that pairs perfectly with seafood. It’s crisp and refreshing, and it has a grapefruit acidity that pairs nicely with the olive oil-poached octopus. Albarino is a perfect pairing with seafood like octopus, as well as olives and tomatoes.
. Of course, if you have a local wine expert that you trust, it’s always best to ask their opinion, because they are very familiar with their offerings. Want to take a wine tasting trip to Galicia to try the Albarino yourself? Check out our guide. Castelvetrano Olives are grown in western Sicily and have an intense green coloring and sweet flavor. The flesh of the olive is more substantial than other olives, which makes it a perfect eating olive for appetizers or finger food at parties. Generally, these olives are found either on a fresh olive bar, raw and unmarinated, or preserved in a jar. They are a great source of mono-unsaturated fat and vitamin E.
I got this recipe from a friend of mine, Marsi Buckmelter. 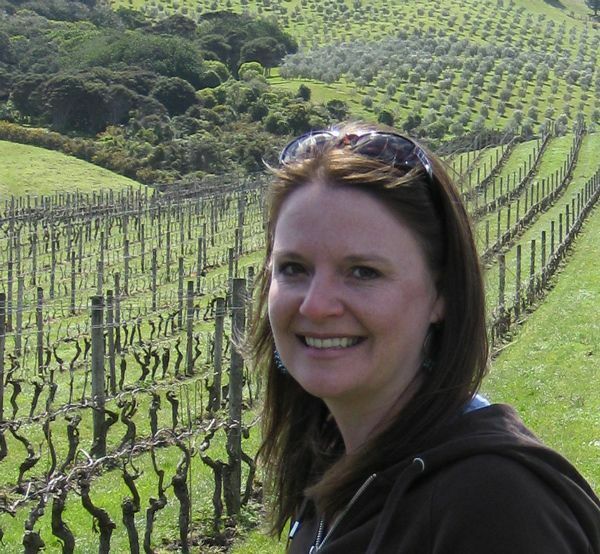 She and her husband, Steve, had these olives at Pizzeria Delfina in the Mission in San Francisco a number of years ago and fell in love with them. She’s been making them at home every since. The olives are so popular that they are still on the menu at Pizzeria Delfina today. The recipe is really easy, and it produces the best tasting olives I’ve ever eaten. Since the octopus requires a lot of olive oil for cooking, this recipe is a great addition because you will make double use of the olive oil. I do sometimes reuse the olive oil a third time to make salad dressing or to drizzle over food. Once it’s been used to cook the olives and the octopus, with all the aromatics used in both, it will have a wonderful citrus and herb flavor that lends well to salad dressing. Pour the Aceites Abril Extra Virgin Olive Oil to cover the olives in a pot. Heat olive oil and olives in a medium sauce pan over low heat on the stove top for approximately 40 minutes. Do not let the oil boil or bubble. Remove from heat a few min before serving to cool slightly. Serve warm in the olive oil. In a pot large enough to fit the octopus (6 qt. for 3-4 lb octopus usually works), add olive oil, bay leaves, and citrus peels. Warm to a simmer on the lowest heat setting. Add the octopus and cook on the lowest setting for 30-60 minutes, depending on the size of the octopus. A 3-4 pound octopus should cook within 60 minutes. When a knife or fork inserts without resistance at the thickest spot, it is done. Do not overcook. Remove from the oil to cool. Slice tentacles and serve with olive oil, a squeeze of lemon and a sprinkle of paprika and salt. This entry was posted in Recipes and tagged Global Gourmet, Spain. Okay Laura, I usually see your posts and have the very same views as you but I will have to say I had to hurry up and scroll through the pictures of this one to get past the octopus! LOL I had some octopus bruschetta in Florida at a Hondurian restaurant and it was okay but had I known what it was, I wouldn’t have tasted it. It’s psychological, I know, but great recommendations and glad you learned some new skills abroad. I’m going to give it a go! Octopus isn’t something I would have thought I would have ever been able to cook at home, but I’m willing to try! Thanks for the tips … will let you know how we go :D! I love pulpo!! Some people find it strange but if cooked properly, it is fantastic! I ate it all over Spain and love the delicate flavor. Although I don’t think I’m brave enough to cook it at home! Allergic to octopus and squid but it I can tell that your cooking is delicious. Enjoy! Love your international cooking at home recipe series idea. What a great way to revisit your memories of trips. That Pulpo a la Gallega looks delicious! Was it hard to find a place to buy the octopus? Hi Debra. It’s not difficult for us here in Seattle because we have a couple of really great Japanese and Chinese grocery stores that always have it in stock. Oooh, been a long while since I’ve last tasted octopus! It’s actually the first time I’ve heard of this dish but it looks great. Thanks for sharing it with us! It’s mostly served in Spain, which I think has some of the best octopus in the world.